I have spent this week thinking about my own life. Why? I am enrolled in the 52 weeks to Better Genealogy program and week 3 is reflecting on our own lives and how we have recorded them. We document our ancestors and living family members but do we take the time to record our own lives. My answer is both yes and no. As an archivist I have always been aware of the need for recordkeeping and one of my almost life long habits has been to keep a record of things I have done. I have kept newspaper cuttings that I have appeared in or have been about me, certificates of courses I have done, thank you letters, invitations and flyers to events that I have spoken at, conference programs and so on. I started this habit with my first ever photo in a newspaper – the South Burnett Times 7 July 1982. Anyone looking at the photo today would not recognise me as a very skinny size 10 with a Mia Farrow haircut. I had given a talk to the South Burnett Genealogical Club and the event had been of interest to the local newspaper. Flicking through to 1986 there is yet another hairstyle and now I am into my ‘big glasses’ phase speaking in Maryborough. 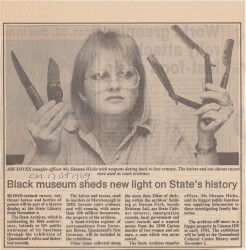 Still with the glasses and a hairstyle very close to what I have now is a photo of me in the Courier Mail in 1989 with an array of blood stained murder weapons. 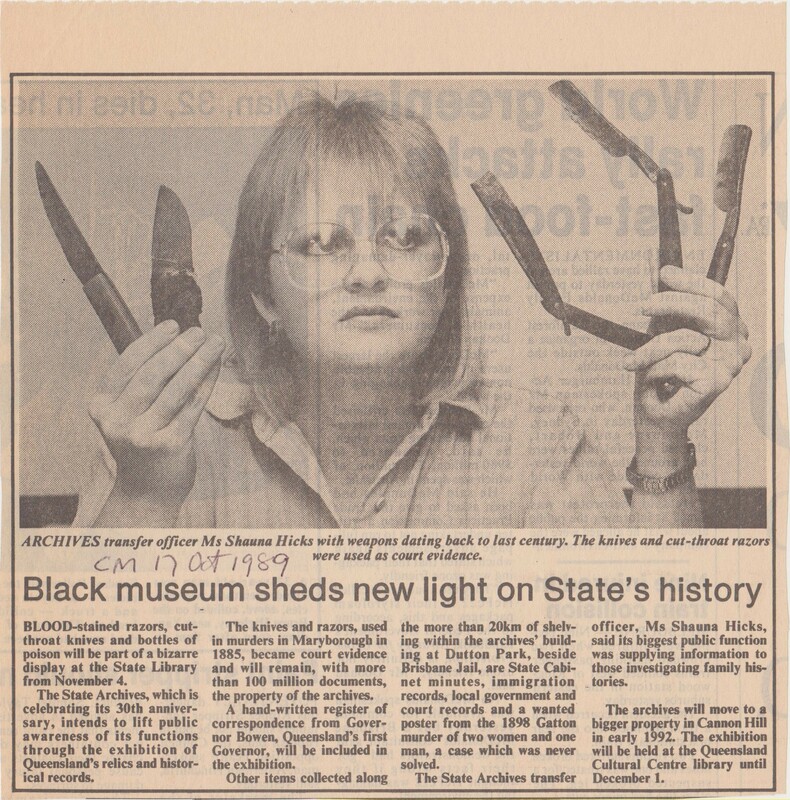 That year was the 30th anniversary of the Queensland State Archives and I organised the exhibition hence the weaponry which the journalist was fascinated with. In 1993 I gave a talk on the sinking of the hospital ship Centaur at the 50th anniversary seminar at the State Library of Queensland. For those who may have missed it, the wreck of the Centaur was recently found and I followed the search with great interest as I had met so many people connected with it in 1993. I seem to have kept the same ‘look’ until about 2001 when I ditched the big glasses for the contact lens and a photo of me at a labour conference in Canberra has me very young and very blonde. I forgot to mention that my hair colour varies from red to blonde and all shades in between! I have eleven of these binders. I don’t want to bore you with the minutiae of my life so I will fast forward to 2009 and my farewell photo in PROV‘s e-newsletter rEsearch which has me looking very much as I do today (which is a bit different from my web photo – now back to blonde). It is hard to believe that these eleven binders represent my life in the public eye, someone who has been advocating family history in libraries and archives since 1981. It is now 29 years since I left my boring government job of 7 years to work in the John Oxley Library in Brisbane. Every talk, seminar, conference and so on is in those binders. I wonder what will happen to them when I am gone? At the beginning of this blog I said both yes and no. The above indicates that I have documented at least one aspect of my life. Also this week and for other reasons, I have been going through my photographs and here I am definitely not well documented as I am usually behind the camera. How true is this for others? I have been putting together an album of photos for my partner to document our participation in the 200th anniversary celebrations in 2007 of the closing of the First Settlement of Norfolk Island. His ancestors Samuel Pyers and Sarah Johnson were both convicts who married on Norfolk and started to raise their family there before the decision was made to close the penal settlement down and move everyone to Tasmania. I have been using Family Photo Book to give my compilation of photos more of a professional look. I have selected photos with Max in them and told the story of the re-enactment so that the album will become a family record for future generations. When our grandkids are older, I can imagine him sitting down and saying ‘I remember when …..’ and showing them the photos of our trip to Norfolk Island. There are a few photos of me taken by others or group photos but not many and I struggled to find suitable ones to include in the album. If I think about the photos we took at Christmas I again have to admit I am missing in action. You would not even know I was there! Same with my mother’s 75th birthday party last year. Did I even attend? Obviously this is one area of my family history I can improve but, and there is always a but, I don’t like my photo being taken which is why I always have a camera in my hand. This may even be why I started keeping the newspaper clippings and other memorabilia as a way of documenting what I have looked like over the years! In all seriousness, family historians should also document their own life stories to hand down to future generations. Although it may sound a bit gruesome, perhaps we should even think about writing our own obituary. What would we want people to say about us after we are gone? As I said in the beginning, this week has been spent reflecting on how I record my own life and what records I will leave behind about me. I have lots about my public life but very little about me on a personal level – I have thrown out my teenage diaries, my old love letters and old photos. I now suspect that I will have to spend a bit of time ‘salvaging’ my personal life and capturing my own memories in the absence of records. Challenge No 3 was indeed challenging – I only hope that future weeks don’t require such soul searching.